This website has lots of non-fiction books about Scotland. The website contains around 200 pages of information which are based on the guidebook "The Glasgow Guide", written by David Williams. The website is in the process of development as an online encyclopaedia, with articles about many towns, villages, famous buildings and the countryside. Biographies of well-known Scots will also be included as well as articles on the history and culture of the country. 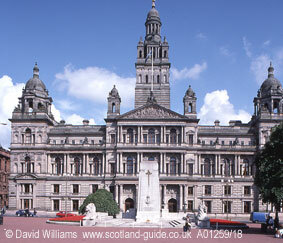 This is the Glasgow City Chambers, the headquarters of Glasgow City Council. It stands at the eastern end of George Square, the main open space in the city centre. In front of it stands the Cenotaph. The elaborate design of the building and its many statues reflects the tremendous wealth possessed by the city in Victorian times. Glasgow`s architectural legacy attracts many visitors, as does its museums, galleries, shops and entertainment facilities.